IBM Acoustic Insights leverages deep learning algorithms to identify sound patterns from unstructured acoustic data. These models can be trained in the cloud to identify anomalies, defects and product quality issues both in finished products and products operating in the field. The solution employs a combination of machine learning based upon curated acoustic recordings of defects and human knowledge to create a library of defects that can be easily deployed to automate quality inspections and diagnostic analysis across the manufacturing and post-sale processes. Via machine learning and human expertise the library can easily be extended to build inspection solutions for new or variations of existing products. The use of sound pattern recognition helps firms non-destructively identify, monitor and proactively remedy quality problems. Clients will also be able to inspect products free of environmental obstructions that can make tests unobservable. Using this technology quality inspectors or repair technicians can distinguish multiple types of faults based on sound. For example, a vehicle engine test can distinguish multiple types of failures based on subtle difference in sound profiles. Increase the accuracy of the model and improve over time based on “training” from human based inspectors and SMEs. Over time the classification of defect types are automatically brought back to the training model. Acoustic-based manual inspection requires highly trained and skilled personnel. For many, the required years of experience and knowledge tends to be siloed. IBM Acoustic Insights augments the knowledge across inspectors and decreases variability. This is important as many firms grapple with high labor turnover and inexperienced new hires. Deploy on manufacturing equipment to detect subtle signs of wear well before damage becomes an expensive problem. Acoustic patterns can be used to identify root-cause analysis and suggested maintenance. Integrate with other IBM analytical tools and methods to detect potential equipment failures based on audio wear patterns. Nearly half of vehicle defects are related to the engine, yet the inner workings of finished engines are difficult to inspect visually. Manufacturers rely on experienced inspectors and physical status checks that are both costly and time consuming. 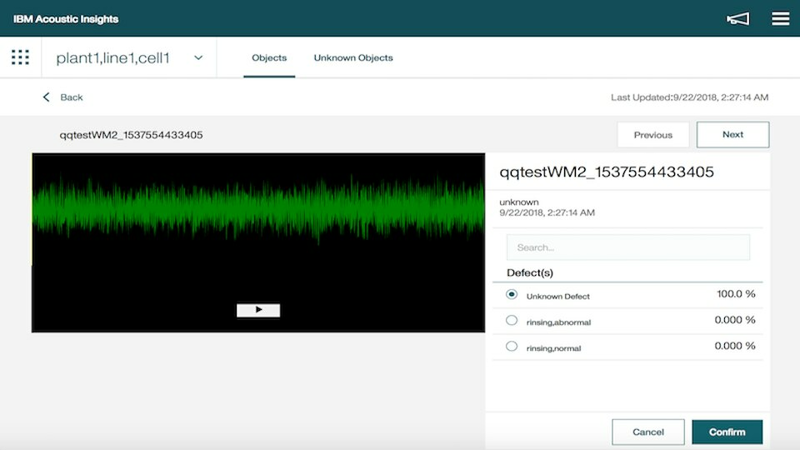 Using IBM Acoustic Insights inspectors can diagnose multiple types of engine faults, which can quickly be diagnosed using basic acoustic sensors. The solution significantly decreases inspector training and the experience required to identify defects. It is costly to deploy a maintenance engineer or field technician to address a product fault in the field. Often these technicians lack a complete understanding of the root cause, which can lead to issues with the required parts inventory. Using acoustic data gathered from embedded sensors and IBM Acoustic Insights, product services teams can understand the fault issue prior to deploying a technician. This can reduce the need for initial services visits and costly followup visits.